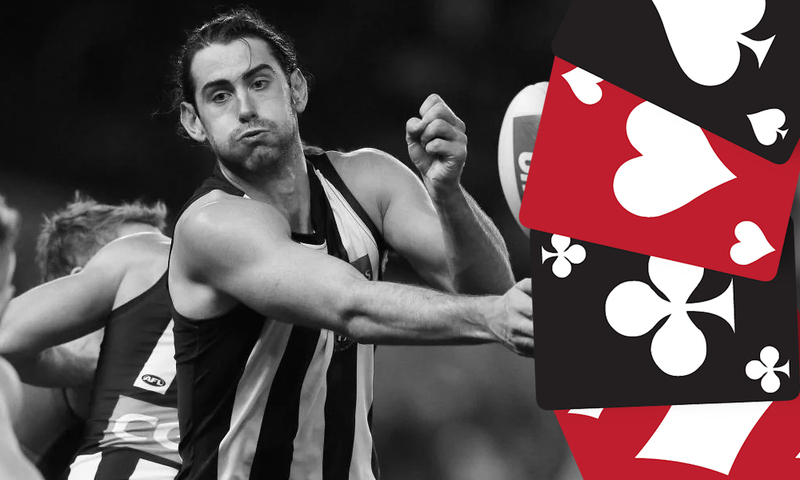 Brodie Grundy has steadily upped average each year since his debut in 2013, averaging over 100 points per game across 2016 and 2017. But in 2018, he broke away from the top-end fantasy ruck group to the elite heights that few players (let alone ruckmen) reach. The Collingwood star’s 2018 season will go down as one of the all time great seasons – a near perfect picture of fantasy dominance. Not only did Grundy elevate himself to be a clear beast in the ruck from a fantasy perspective, he blew away his competition – finishing 9 points clear of the #2 ruck (Gawn) and another 10 clear of Stef Martin at #3. So from a draft point of view, you’re not only picking an elite player with your first pick; you’ll have an insane advantage over your fellow coaches in the ruck position. So let’s talk about Grundy’s 2018 season. In a year that drew many accolades – not least his first AA nod – Grundy went absolute HAM. If we break down the perfect fantasy game, we need durability, a high ceiling and reliability. Not only do they need to go big, but they need to do it often and rarely drop below the 100-pt barrier. First, durability – easy: since Grundy’s emergence in 2015, he’s missed just 6 H&A games and has played allbut 3 games in the past three seasons. 2018 marked the first time he played the entire season. CHECK. Second, a high ceiling: you need only take a peak back at his catalogue of scores from the past 12 months to see his ability to go big. Brodie scored above his average (120+) on twelve occasions, which, if a 120 score isn’t impressive enough – consider that 6 of those were above 130 and his year was littered with dominant displays – 141, 150, a pair of 147s and a 151. Grundy is in the top echelon of big scorers. Can he push even higher though and truly tear apart the stat sheet like many of his midfield compatriots? Regardless, HUGE CHECK. Third and finally, Grundy hit the 100 mark in all but three games of 2018. His ‘hit rate’ for a premium player was better than any player in the game last season – even Tom Mitchell, who dropped below the ton five times. Our Collingwood big man also had one helluva streak – tallying 14 straight tons from Rounds 2 til 16 – remarkable consistency for a position that rarely displays it. Add to this Grundy’s formerly noted 12 games above his average (Titch did so 13 times) and you know he’s a safe bet. CHECK CHECK CHECK. With many changes on the cards at AFL House over the off-season, our game may look slightly different on the field in 2019. But I’m here to tell you that our #1 ruck shouldn’t be affected. In fact, the new rules in marking contests may just result in a few more sausage rolls for Grundy up forward. Add to this his motivation for team success after the disappointment of 2018 and… dare I say it – Grundy could go EVEN HIGHER this season? There are few players in the game whom we can safely lock in at top dollar or pay a high draft pick for that we can rely upon not to bust. Brodie Grundy looms as one of these. Each season since the retirement of GOAT Alum Dean Cox, we have seen a different ruckman at the top of the points scored rankings every single season. Last year it was Grundy. 2017 it was Kreuzer. 2016 saw Gawn top the charts. 2015 it was Todd Goldstein. 2014? Sam Jacobs. Granted, it would have to be a massive drop or some seriously bad luck for Grundy to come back to the pack. But there’ll be a solid group of experienced big men trying to steal his crown in 2019 – so if you’re spending a top 3 draft pick or over $870K on your R1, you’d want to feel very good about it – zero doubt in your mind. Perhaps if you want to go looking for reasons to avoid picking Grundy, I could point to his incredibly rich price tag or his incredibly high (likely) ownership. But neither hold any real sway given he’ll almost certainly be the best ruck in 2019 by some way. ACE – Grundy had close to the perfect fantasy season in 2018. There don’t appear to be any/many strong reasons as to why he can’t do it again, either. It’s crazy to think that Grundy is still just 24 so has his best ahead of him. He has an excellent blend of high-scoring, durability and reliability – making him one of the easiest set and forget picks of 2019. Where would you select Grundy overall in Draft? FOLLOW US ON TWITTER: @McRathDT and @DTTALK for all thing AFL Fantasy (and more). Got something to say about the deck? Use the hashtag… #DeckofDT. I’ll be taking him #1 if i get the chance.